Honestly, how does that ball leave the park? I wish I had that kind of power for like a week, maybe a couple of days. Kris Bryant smacked a three run homer this afternoon for Iowa, it was his fifth home run in six starts at AAA. Keep raking, so I can keep posting these videos! After hitting two bombs on Sunday, Kris Bryant went deep again yesterday, that’s four homers with Iowa already. New level, same results. Sorry this is a little late, we were busy with the Kane County Cougars yesterday, that post is coming. Kris Bryant, boys, and girls. Thanks to Mike Sorenson for sharing on twitter! Kris Bryant made the wait for the Iowa Cubs game today well worth it. After a lengthy rain delay, and three empty at bats from Bryant, he delivered. After falling behind 0-2 in the count, Bryant worked it full and drove the next pitch over the right field wall for his first AAA home run. The kid is special, the fans in Tennessee learned that quickly, now the fans in Iowa will figure it out, then… well, Chicago. Kris Bryant Promoted to Iowa! 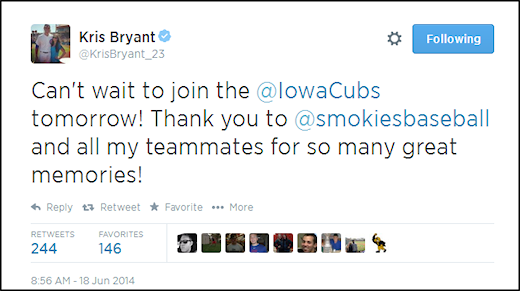 The hype machine is now in full effect as Kris Bryant himself announced on twitter that he is headed to Iowa. The kid has been crushing it at Double-A, just won the HR derby at the all-star game, and has basically embarrassed every pitcher he has faced. Time for the next challenge, interested to see how he adjusts to Triple-A pitching. 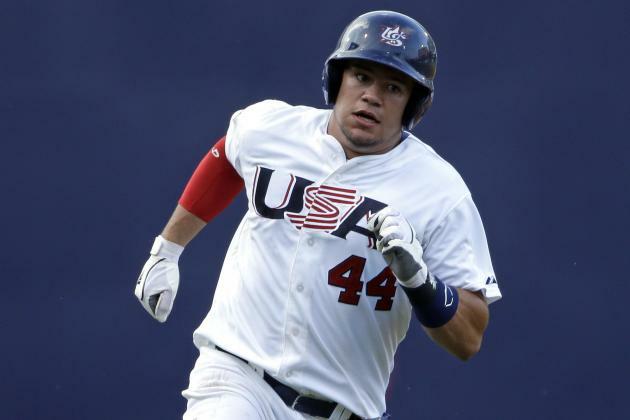 Author bornonthirdcubsPosted on June 18, 2014 June 18, 2014 Categories 2014 Minor Leagues, Iowa Cubs (AAA) 2014, Tennessee Smokies (AA) 2014Tags Kris Bryant Promotion, Kris Bryant to IowaLeave a comment on Kris Bryant Promoted to Iowa! That sound… welcome to professional baseball.